We wanted to pay tribute to Dan Air Engineering. Most people forget when they are flying, that a tremendous amount of hard work, skill and dedication goes into making an aircraft safe. Dan Air Engineering did a sterling job in that field. Maintaining a fleet of up to 60 aircraft in the Dan Air fleet. They were also responsible for maintaining the fleets of many other airlines, including those of Air Europe, Airtours, and Laker. The staff were responsible for Aircraft belonging to Sultans and Presidents. Here is a brief history of the company. Following Dan-Air's acquisition of three Avro Yorks in 1954, the airline selected Lasham Airfield, a former Royal Air Force World War II airfield near the northeast Hampshire town of Basingstoke, as its maintenance base due to the ample availability of hangar space. Meredith Air Transport, whose operation at Southend Dan-Air had taken over at the time of its formation, lacked adequate maintenance facilities at that airport. When the fledgling airline moved its operating base to Blackbushe in 1955, it continued to face a shortage of adequate maintenance facilities as Airwork, Britavia, Eagle, Silver City and Westminster Airways, whose presence at the airport predated Dan-Air's, had already occupied most of the available hangar space. Blackbushe's lack of space resulted from its earlier use as a military airfield where no provision had been made for future commercial operations. The airport's biggest drawback was its location on both sides of the A30 along the Hampshire-Surrey county border, with the terminal and apron to the north and the maintenance area to the south, and taxiways as well as one of the runways crossing it. This arrangement necessitated frequent closures of the busy road on account of aircraft moving across it, thereby preventing the efficient use of both road and airport as well as ruling out any expansion. At the time, Lasham Airfield was in excellent condition, featuring a newly resurfaced runway and a large, empty hangar. The Air Ministry had decided to upgrade the airfield following the end of the Berlin Airlift in preparation for further Cold War tensions. Eventually, Davies and Newman, the parent company of both the airline and its new engineering offshoot, managed to negotiate a 21-year lease of the airfield's maintenance facilities with the Air Ministry. 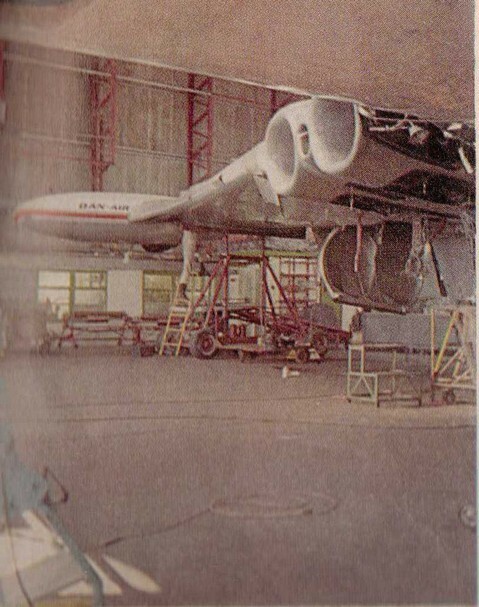 Dan-Air Engineering's first phase of major expansion occurred at Lasham, following Dan-Air's purchase of a pair of de Havilland Comet series 4 jetliners from British Overseas Airways Corporation (BOAC) in 1966. These aircraft were ferried from BOAC's Heathrow base to Lasham during the early summer of that year for conversion by Dan-Air Engineering from a 74-seat, low-density, two-class long-haul scheduled configuration into a 99-seat, high-density, single-class short - to medium-haul inclusive tour (IT) layout. This conversion also involved structurally "reinforcing" the aircraft — including strengthening the cabin floor and the wing roots — as they were expected to perform many more takeoffs and landings after entering service with Dan-Air (compared with their original role at BOAC). 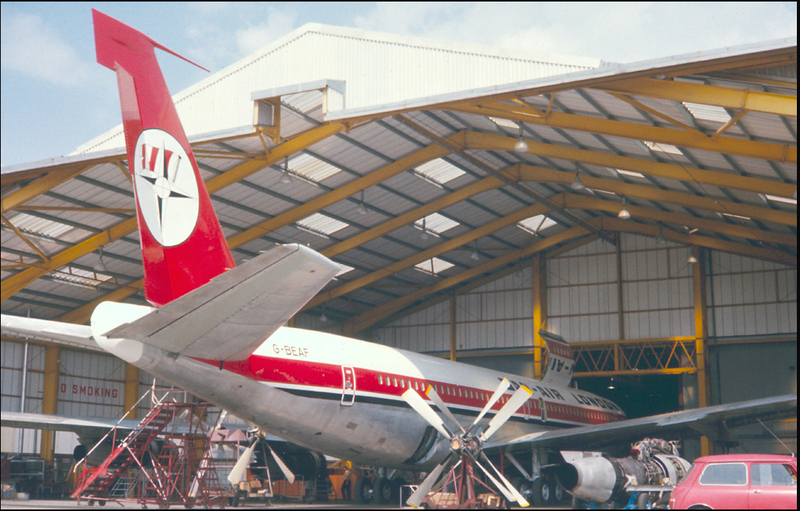 Dan Air subsequently acquired, larger Comet series 4B and 4C aircraft, these too underwent similar structural modifications to enable them to carry up to 119 passengers before entering service. Lasham in 1969 - Enginerering work on a Comet. Dan-Air's acquisition of its first two BAC One-Elevens from American Airlines in 1969 necessitated a major modification programme at Lasham before these aircraft could join the UK civil aircraft register as these were 400 series models that had been built to comply with US airworthiness requirements, which differed in several important aspects from the UK's airworthiness requirements. 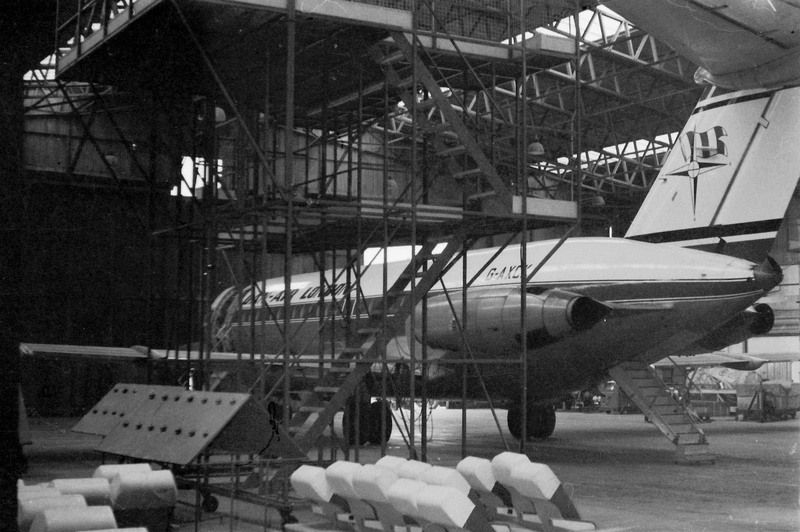 The introduction of Dan-Air's first American-built jet aircraft, an ex-Pan Am Boeing 707 320 series "Intercontinental", in 1971 eventually led to Dan-Air Engineering being granted "FAA Repair Station" status. This meant that it could perform maintenance, repair and overhaul (MRO) tasks on aircraft that were on the US civil aircraft register and/or were governed by US airworthiness standards. 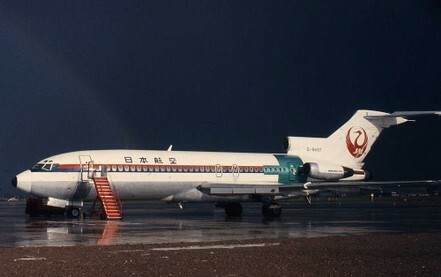 Dan-Air's decision to become the first British operator of the Boeing 727 resulted in the purchase of three 100 series examples from Japan Airlines (JAL) in 1972. As these aircraft lacked high frequency (HF) radios, they needed to be flown across the Pacific with two intermediate 24-hour stops at Wake Island and Honolulu (where the aircraft refuelled and waited for the overflight of the next scheduled Tokyo — Los Angeles 747 service to provide navigational assistance for the next stage of the onward journey until Los Angeles was reached). After reaching the US, they underwent an extensive modification programme at Boeing's Wichita plant in Kansas to comply with British Civil Airworthiness Requirements (BCAR). These modifications entailed the installation of and additional emergency door on each side of the rear fuselage and a full stall-protection system, including a stick pusher and stick shaker. Following their arrival in the UK at Dan-Air Engineering's Lasham base each aircraft was fitted with new galleys manufactured by Dan-Air Engineering together with 150 seats. The aircraft were also repainted at Lasham prior to their entry into service with Dan-Air in 1973. Left - G-BAEF in JAL colours with it's UK registration. The new emergency doors are visible. The Aircraft was repainted in Dan Air colours shortly afterwards. Right G-AXCX BAC 1-11 in 1969 - Images can be enlarged. Hangers at Lasham (Left) and Manchester (Right) - Images can be enlarged. 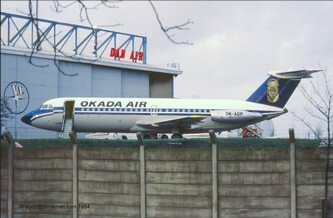 Since the beginning of the 1980s Dan-Air itself had been looking at introducing aircraft that were more advanced and had a greater seating capacity than the Boeing 727-200 Advanced, the largest contemporary aircraft in the airline's fleet, to combat rising jet fuel prices and to make the best use of Gatwick's increasingly scarce early morning peak time slots. This led to the evaluation of the Boeing 757 and several other state-of-the-art, high-capacity narrow - and widebodied aircraft types. 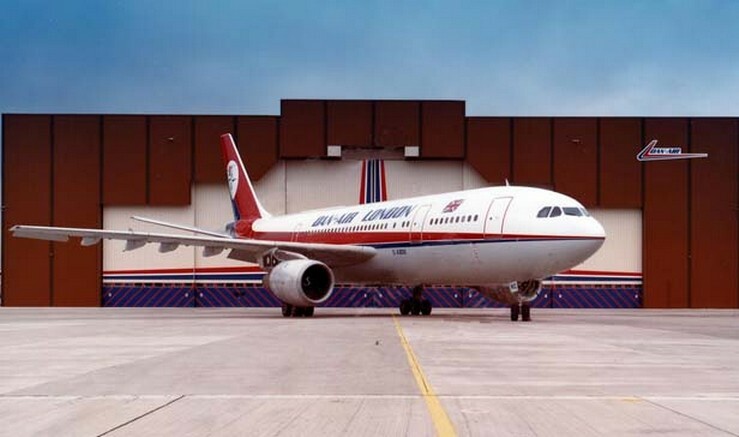 That evaluation process resulted in the introduction of a 336-seat ex-Hapag-Lloyd Airbus A300 B4 series widebodied aircraft into Dan-Air's fleet in 1986. This in turn necessitated putting in place the maintenance infrastructure to support the operation of the airline's first widebodied type at Gatwick. Gatwick's increasingly tight slot situation from the second half of the 1980s made frequent ferry flights to/from Lasham and Manchester to maintain Dan-Air's large, Gatwick-based narrowbodied fleet less and less feasible as each movement accounted for by a non-revenue flight represented a lost commercial opportunity. The opening of Dan-Air Engineering's third maintenance base resulted in an increase in the engineering unit's total staffing level to over 1,600. Airbus A300 G-BMNC at Dan Air Engineering's Gatwick Hanger. Following Dan-Air Engineering's sale, Dan-Air awarded FLS Aerospace the contract for the maintenance of its fleet. (FLS Aerospace's loss of the Dan-Air maintenance contract as a result of the airline's takeover by British Airways in 1992 led to the decommissioning and mothballing of the hangars it had acquired from Dan-Air Engineering at Gatwick and Lasham. The Gatwick hangar was subsequently brought back into service in the late-1990s following British Airways's decision to make the airport a major hub. It was decommissioned once more as a consequence of British Airways' subsequent decision to de-hub Gatwick, following the adoption of a new corporate strategy aimed at restructuring the airline's loss-making operation at the airport in the aftermath of recording its first-ever full-year loss since privatisation in 2000. Most recently, on 1 August 2006, Virgin Atlantic took over this hangar to provide an in-house maintenance capability for its growing Boeing 747-400 fleet at Gatwick as well as to support sister airline Virgin Nigeria's daily Airbus A340 operation from/to Lagos at the airport. Meanwhile, FLS Aerospace itself was acquired by SR Technics, the former maintenance arm of defunct Swissair, in 2004. Towards the end of 2006, SR Technics in turn was jointly taken over by the governments of Abu Dhabi and Dubai (through Mubadala and Dubai Aerospace Enterprise, respectively), who then incorporated it into their nascent MRO venture. The former Dan-Air Engineering maintenance base at Lasham was acquired by ATC Lasham, a Boeing MRO specialist, in 1995. Dan-Air Engineering restored one of the Douglas Dakotas operated by Dan-Air as the airline's first aircraft, applying the contemporary livery and aircraft registration (G-AMSU). The aircraft, which was originally registered G-AMPP when in commercial airline service with Dan-Air, was on display at Lasham from 1971 until 1991. During the early-1980s Dan-Air Engineering's Manchester base designed and installed a then unique cargo door in one of Dan-Air's Hawker Siddeley 748 turboprops that had specifically been acquired for this purpose. This enabled the aircraft — a series 2 HS 748 (registration G-BIUV) fitted with an 8 ft (2.4 m) by 8 ft (2.4 m) rear cargo door — to carry "outsize" cargoes, such as pipes and oil drilling equipment measuring up to 6 in (15 cm) in diameter and up to 40 ft (12 m) in length, which made it particularly suitable for oil industry support work. During the 1980s Dan-Air Engineering held the contract to maintain the Qatar Amiri Flight's Boeing 727-200 Advanced VIP aircraft fleet. The flight deck crew flying these aircraft were seconded from Dan-Air.